If I’m not mistaken, there are four versions of Shaquille O’Neal available in NBA Live 18 Ultimate Team: Orlando Magic, Los Angeles Lakers, Miami Heat, and Cleveland Cavaliers. Although all are desirable Legends cards, the Magic and Lakers versions are the most coveted. The former has slightly superior athletic ratings, but the latter is by no means a bad card to own. 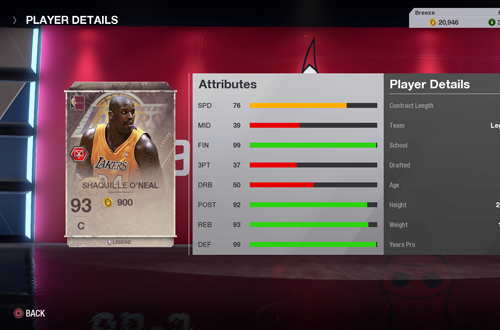 I was fortunate enough to pull Lakers Shaq from a pack purchased in the store, a very lucky draw as the card can be found at some truly outrageous prices in the Auction House. I’ve been able to save my coins to bid on or buy other players though, while still being the beneficiary of the Shaq Attack. Well, mostly; when it works, at any rate. A few Legends have unsuitable dunking tendencies and dunk packages, meaning that they don’t perform dunks as often as they should. Lakers Shaq isn’t the worst example as he can dunk and does indeed perform a version of his famous two-handed rim-rocking slam, but he’s not as effective as he should be inside, especially after layups and post shots were nerfed. There are also times when he’s been swatted with ease, or stopped in his tracks by smaller players whom he should be overpowering. That’s something I’d like to see fixed in NBA Live 19, but for the moment, it is quite satisfying when Shaq does obliterate a defender. I’m not exactly a fan of the Golden State Warriors – for many of the reasons a lot of fans probably disliked the Chicago Bulls in the 90s – but there’s no denying the talent on their roster, or their dominance these past few years. 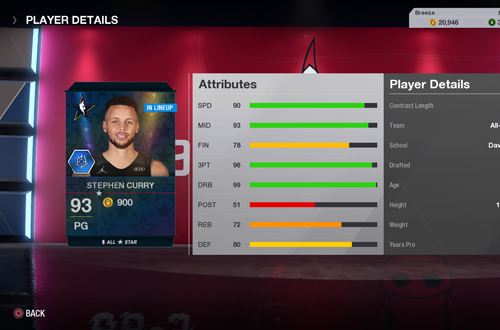 It certainly doesn’t hurt to have some of their players on your Ultimate Team, and in my case it’s the player who is arguably the best shooter in NBA history: Stephen Curry. To be specific, I have his All-Star card, drawn at random and made permanent by completing the Team Stephen Challenge back in February. I did enjoy having him in the lineup for a while, but when I began assembling my 90s All-Stars lineup, he ended up back in my Inventory. Even though I’ve had a lot of fun playing with the 90s All-Stars squad and they did serve me well through weeks of challenges, I’ve found myself in need of a change, and wanting an opportunity to play with some of the other cards I’ve collected. As I put together a new lineup of active players, All-Star Stephen Curry was the logical choice to be my starting point guard. Boasting a three-point rating of 96, he bolsters my perimeter offense, packing a slightly stronger punch from the outside than Mitch Richmond and Glen Rice. With his 99 Dribbling rating, he’s also much more adept at leaving defenders in the dust before drilling long bomb after long bomb. When I was putting together my roster of 90s All-Stars with the help of a few cards I’d auctioned off, and a generous gift from ToneLoc21, I made sure to get some of my all-time favourites first. 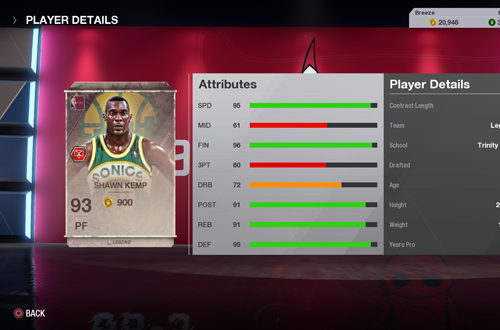 At the time, the SuperSonics version of Shawn Kemp was on the Auction House at very high prices, and since I was trying to budget my coins to get as many 90s players as possible, he was out of my range. I ended up finding the Cleveland Cavaliers version much cheaper, and figured that I’d make do in the short term. Although not as good as the Sonics version, Cavs Kemp still played like The Reignman, dunking over defenders with authority. We can assume that it’s ’98 Kemp. I eventually managed to pick up the superior Sonics Kemp at a reasonable price, at which point I auctioned off the Cavs version to get back some of my coins. Quicker up and down the floor, his ability to leak out for dunks on the break helped me out a few times in comeback victories. It’s naturally been fun to pair him up with Gary Payton and relive the original Lob City, too. The only drawback is that with the 2018 All-Star jerseys that I’m running with, both The Reignman and The Glove are sporting the Oklahoma City Thunder logos on their uniforms, rather than Seattle Supersonics branding. Nevertheless, I’m glad to have them suiting up for my Ultimate Team. As I mentioned, after using a stacked squad of 90s Legends to play through several challenges, I felt like giving those old favourites a rest and changing things up with some active players. I also found that I was missing the benefits of having a stretch four, a role that Legends like Shawn Kemp and Karl Malone – for all of their other talents – just couldn’t fill. I’d earned Dirk Nowitzki’s Big Moments card as a reward in a Team of the Year Challenge, and was eager to try it out. 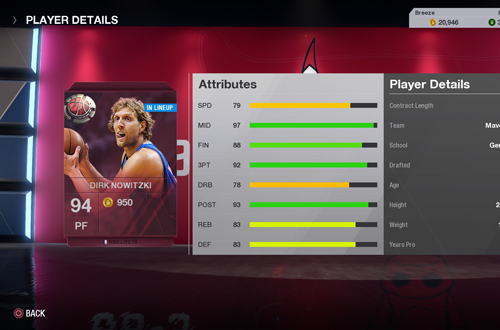 One of my highest rated non-Legends cards, Big Moments Dirk boasts strong offensive ratings including 97 for Midrange, 92 for Three-Pointers, 93 for Post-Up, and 88 for Finishing. Not surprisingly, he’s turned out to be one of my most effective scorers. In fact, I start out a lot of games by feeding Dirk in the corner for a three-pointer; again, something I couldn’t do with The Reignman or The Mailman! Deadly when he’s open and still dangerous when he’s being guarded, the ability of this boosted card to stretch the floor has facilitated some big wins, and gotten me out of some tight spots in close games. I’m a fan of the real Dirk, and it’s been fun to have him on my Ultimate Team squad as well. Entering his twenty-first season, his regular card isn’t quite as good, but the boosted Big Moments version is one of my favourite cards, and frankly, a must-have. Honestly, my time with Ultimate Team has felt worth it since the moment I drew a Scottie Pippen card when the Chicago Bulls Legends were in the featured pack. Even though I’d enjoyed putting together a squad of 90s All-Stars back in NBA Live 15, the one player I was never able to acquire was Pip. My second all-time favourite player right behind Michael Jordan, I was eager to have him as the star of my team. With MJ being exclusive to NBA 2K and therefore unavailable as one of the Legends in Ultimate Team, it reminded me a little of playing basketball games back in the 90s, where his absence made Pippen the star. Well, Pippen and Roster Player. Unfortunately, Pippen’s card was a little disappointing at first. Although a capable shooter from midrange and three-point territory, and suitably beastly at the defensive end, Pip’s original dunk package was one of the problematic ones. He barely threw down any dunks, and those he did perform were rather pedestrian. Fortunately this was fixed in an update, leading to him slamming it home more often, and finishing over defenders with high-flying poster dunks. Whether playing him at small forward or point guard, he’s been instrumental in a lot of my victories in Ultimate Team. He’s my favourite Legend in the game, and therefore my favourite Ultimate Team card. For those of you who have been playing Ultimate Team in NBA Live 18, what have been your favourite cards this year? Is there anyone you wish you could’ve acquired? Let me know in the comments section below, and as always, feel free to take the discussion to the NLSC Forum! That’s all for this week, so thanks for checking in, have a great weekend, and please join me again next Friday for another Five. Yeah, the Auction House is pretty quiet in NBA Live 18 these days, so I can’t imagine there’s much activity at all in NBA Live 16.